Now isn’t that strange… Who here would have spotted or taken notice of this if I hadn’t pointed it out? No one… That’s what I thought! This piece coupled with its small size and excellent camouflage ability (thanks to some other more conventional artists) is one that would be very tricky if we were actually playing Eye Spy. 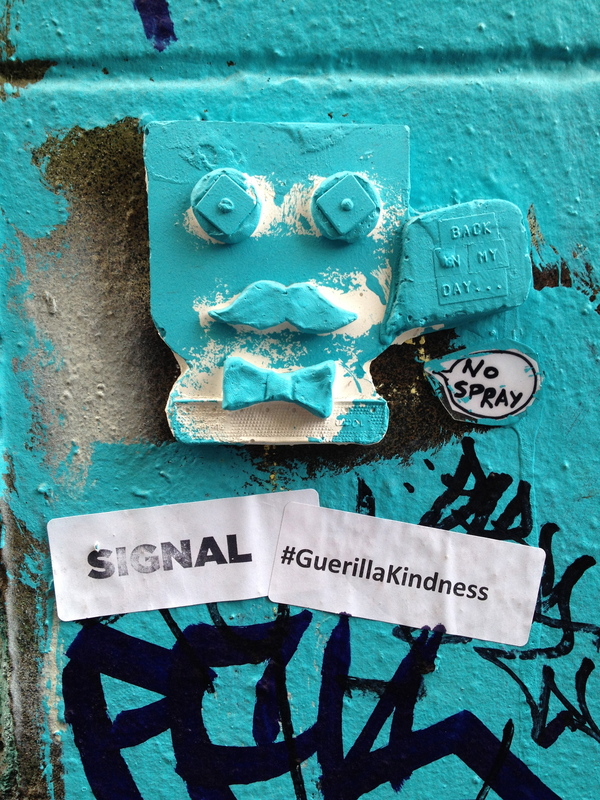 This piece, which kind of resembles the monopoly man, was a part of the #GurillaKindness project which was spoken about in the overview of the tour – a project which involved young people exploring art works that are kind to the environment and people around them. This artwork uses recycled goods glued together and then glued/plastered to the wall. Take note on how this work has been sprayed over with paint too, as we will be talking about that a bit later in the tour. “Something on the Wall,” Street Art deTours, accessed April 20, 2019, http://streetartdetours.com/document/906.